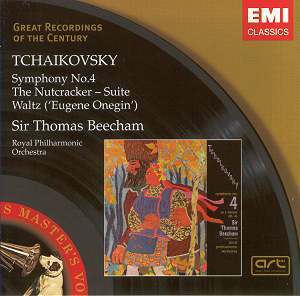 Collectors will remember this collection – minus the delicious Eugene Onegin waltz which is an addition – from the Beecham Edition release of 1990 [CDM 7 633802]. Its appearance now as a GROC is more than welcome and entirely deserved. The Symphony receives a performance of wonderful balance; a perfect trade-off between the visceral and the introspective served up quite without ostentation or exaggeration. The architectural surety of the conception, though a product of sessions a year apart, tends to destabilise those who argue that Beecham’s symphonic control was imperfect. This is a criticism usually applied to his Beethoven or Brahms recordings, though why those critics fail to extend such strictures to his Sibelius or Tchaikovsky I’ve never quite understood. Beecham allows tremendous opportunities for felicitous wind comments – freedom within a certain pulse it should be added – and ensures real string cantabile, lyric phrasing and magnificently measured outbursts as well. Pointing remains witty and incisive and the performance as a whole a match for pretty much anyone, in terms of conception and execution. This was however always a quixotic recording for one reason. The Paris sessions that produced the first movement were in mono; attempts to record in London in stereo foundered and only the first movement was taped in stereo. So what we hear is good 1957-8 mono. Other transfers have included the stereo-mono switch. The tapes have also been subjected to what EMI calls ART – Abbey Road Technology, a clean up that seems to have produced some interesting results. For a start this transfer is cut at a somewhat higher level than that 1990 edition. It’s also got more presence and more bite. Perhaps too that’s a little more glare on the brass and less obvious warmth. But certainly the reading does come alive in this new restoration. In The Nutcracker his principals are on suitably delectable form. The flutes are delicious in the Allegro giusto, whereas Beecham is quite slow - not cautious exactly but rather patrician - in the March, though the pizzicati are animated enough and rhythmic points register with unadorned excellence. There's verve and elegance in equal measure in the Trepak – a real “make the buggers hop” tempo this and impossible to dance to - and the Danse Arabe is taken at a decent speed, fully conveying its incipient drama. Rather slower than usual but nicely inflected the Danse des Mirlitons certainly escapes the charge of being over dainty and merely elfin in Beecham's leisurely hands. Come the Valse des Fleurs and we can admire the burnish of the RPO's violas and cellos and the effulgence of the brass. Don't expect absolute daemonic drive from this Nutcracker; Beecham is altogether more affable and even-tempered and delightfully warm. The transfer has ensured that things such as the flute solo in the Danse chinoise are not as “blasty” as in previous incarnations. You may for instance have caught just such a transfer on the Sony Beecham edition - SMK87875. Catch it anew and newly garbed in this winning disc.